The program is free. the results are invaluable. The Steppingstone Academy seeks Scholars who like to rise to challenges, value excellence, and want to thrive and grow in a dynamic educational community. To be eligible, applicants must be residents of the city of Boston and currently in their fourth- or fifth-grade year. Steppingstone Scholars are serious about their studies. During the academic year, and during six-week summer sessions, they put in hundreds of extra hours on schoolwork. Their hard work pays off. Steppingstone partners with more than 40 independent, Catholic, and public exam schools to place students. In addition to readying Scholars for the academic demands of these selective schools, we help them select and apply to the schools that promise them the best fit. Steppingstone also helps families seek the financial aid they may need to cover the cost of tuition. If you know a hard-working student who ought to be college-bound, and would benefit from the rigors of Steppingstone, we’d like to hear from you. Steppingstone welcomes recommendations and nominations from teachers, counselors, coaches, and members of the public. 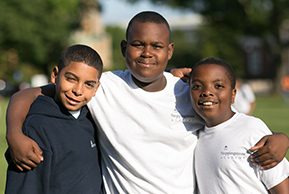 The Steppingstone Academy prepares motivated, underserved students for acceptance to and success at top independent, Catholic, and public exam schools in the greater Boston area. 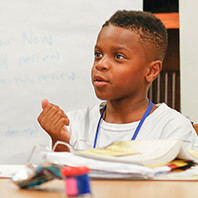 Scholars, who are admitted the spring before their fifth- or sixth-grade year, participate in a rigorous course of academic preparation that spans two summers and one academic year. 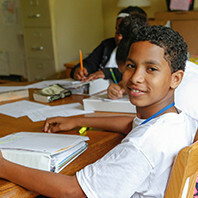 To remediate achievement gaps and prepare for the demands of the most selective schools in New England, each Scholar puts in hundreds of hours of extra school work and prepares to take the Independent School Entrance Exam for admission to a selective school in the fall of his or her fifth- or sixth-grade year. Steppingstone Scholars and their families also work closely with experienced staff advisors to select and apply to those schools likely to offer the best fit and learning environment for each individual student. In addition to placement assistance, families receive financial aid counseling to assure that their demonstrated financial need can be met. All this hard work pays off. 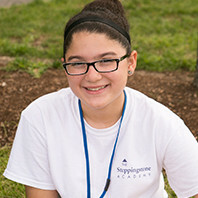 Ninety percent of Scholars who have completed Steppingstone’s demanding program of academic preparation gain admission to an independent, Catholic or public exam school. Virtually all of them go on to graduate high school, and 80 percent earn a four-year degree within six years. 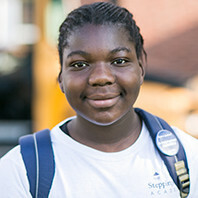 While preparation is essential, sustained support is another key to Steppingstone’s Scholars’ success. Counseling, academic advising, tutoring, and college-readiness services continue throughout each Scholar’s middle-school and high-school years. Steppingstone’s College Services team offers additional help to undergraduate Scholars. And Alumni Relations provides an array of volunteer, social, and professional development opportunities to Alumni launching their careers. Each year, The Steppingstone Academy serves nearly 1,000 Scholars in grades 5 through 12, as well as hundreds of Scholars in college. Around the country, more than 800 Steppingstone Alumni are contributing to their communities through various professions and post-graduate programs.